Another product from Ed, Inc… This is the second product I’ve worked on for RDP’s Blood Throne setting. Enjoy! Written by Hal Maclean and Mathew Kaiser, the Blighted Bestiary presents a host of new monsters and minions designed to help the blight elves carry out their crusade of visiting misery to every corner of the world. Though designed as a companion volume to Blight Elves: Architects of Despair, a Narrator could easily adapt the creatures, templates and even stat blocks of different creatures found within this book to fit other situations. Every world needs villains, the more dastardly the better, and the blight elves, devoted servants to the goddess of suicide, bring an entirely new dimension to villainy. Seeking not territorial aggrandizement or personal glory, but rather to make every living creature prefer death to life, the blight elves apply every facet of their pitiless lore to manufacturing servant creatures. Twisting flesh and bone to suit their purposes, they delight in the certainty that most of their vassals suffer with constant torment, both physical and psychological. Only the safeguards bred into them by their masters keeps these wretched creatures from taking revenge for the misery of their existence. Blaze Shrikes: birds with combustible blood that serve their masters as free-willed grenades. Blight Nags: Once noble steeds twisted into slavish battle mounts that radiate an aura overwhelming melancholy. Bone Gallows: An undead lynching post made from the bone and flesh of earlier victims. Carrion Claws: Emaciated predatory cats that must feed through their claws by stealing life energy from their victims. Desiccated Colossi: Giants that drain the moisture from their victims with the slightest touch. Dracoraptors: Flying reptiles with breath so repulsive few creatures can stand against them. Dust Stalkers: Disease ridden guard animals trained to hunt and kill. Fendracs: Psychic wolves psychically linked by a pack mind. Frost Creeps: Giant worms that emit a slime that liquefies and then freezes their surroundings, making it all but impossible for their victims to escape when they roll over them. Hollowhorns: Gigantic rams that make sounds that grow more terrifying the faster they move. Hookhides: Huge froglike creatures covered in barbed quills capable of shredding through entire squadrons with each leap. Killstings: Giant wasp like creatures that implant rapidly maturing eggs in their victims causing squirming grubs to almost instantly spill out of the wound. The Blighted Bestiary works well as both a supplement for the Blood Throne Campaign Setting or as a stand alone creature supplement for use in your own campaign! Life is a meaningless torture only made bearable when enjoying the misery of others. If you are too blind or weak to accept this… Dear brother… My king… We will use your own suffering to prove it. RDP is pleased to announce Blight Elves: Architects of Despair, a supplement for the Blood Throne campaign setting by Hal Maclean! Blight Elves: Architects of Despair offers Narrators and players a definitive look at the cruelest race to walk to lands of Simarra. Worshipping a goddess who has taken suicide as her own personal portfolio, the blight elves seek not to conquer the world, or even wantonly destroy it, but rather to drive every mortal soul to choose death over life. They consider the spread of misery for misery’s sake their paramount mission, and regard torture, both physical and psychological, as the highest of all art forms. Inside this 56 page E-book you will find new powers, feats, heroic paths and path masteries, new poisons, diseases, weapons and much more! Blight Elves: Architects of Despair also introduces new villainous paths which allow you take your True20 campaign in new, dark directions. So grab your copy today and delve into the mysteries of these vile creatures! Grab your copy today at Paizo, RPG Now, and Your Games Now! 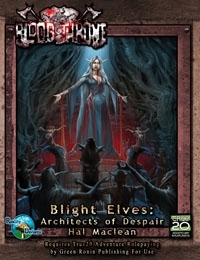 Editor Rone Barton and brand manager Ed Healy (that be me) recently had a chat with Sam Chupp of The Bear’s Grove podcast regarding Blight Elves: Architects of Despair. Have a listen: Episode #38.